I’m so excited you found me! Do you want to move forward & start feeling good from the inside out? To start SOARING instead of feeling stuck+stagnant? Do you want to gain clarity & figure out again and again who you truly are and what you’re capable of in every area of your life? Are you ready for fresh changes & new insight, stress relief & fun? I specialize in PSYCHOTHERAPY,INTUITIVE BODYMIND BALANCING,REMEDIAL MASSAGE & BODYWORK & EMOTIONAL EMPOWERMENT COACHING. I run courses online & at my center Sana Wellness and run ADVENTUROUS SPIRIT RETREATS for your mind, body and soul. I work with you one on one in person+online & in intimate group settings. Subscribe to my FEEL GOOD FREEDOM JOURNAL (it’s free!) so I can get to know you better and what you need (I love when you reply to my emails so much! I want to know you too!) and share with you what I’m learning. GET MY FEEL GOOD FREEDOM JOURNAL FREE!! Do you ever feel like you're missing a couple pieces of the puzzle & wish you had a clearer view of what was really happening? That if you only had a better understanding of yourself you could see the whole picture, and understand how to move forward? Psychotherapy provides you with a goal-directed conversation in the service of change, that rises from the present moment. These sessions support you to evolve into a more clear & aligned version of yourself and can be a vital part of your self care+well being routine. Have you tried different practitioners and yet something is missing? Do you want more, something really life changing, but don't know where to start? Getting clear on WHO YOU ARE is the greatest gift you can receive. This session is a Physical+Emotional+Spiritual Session all in one!!! In a BodyMind Intuitive Session we will focus on enlivening a deeper connection to your body & its wisdom from the inside out. I will incorporate psychotherapy, energetic and intuitive tools as needed to support your body to express the intelligence to heal itself, while helping improve your health & happiness and combined to facilitate any number of incredible changes for you. I can tap into your bodies energetic expression+wisdom from anywhere so we can work together in person or online. Hooray! Resonating? click me to hear more! My massage feels like heaven on earth! Just saying! And it can help you to get active and stay that way! Yay! I love using unique techniques & combinations like scraping+modern cupping with my remedial+therapeutic applications to create a winning system that best suits your needs. Hear more about what you may need to feel better! Do you know you have more to offer? Do you want to fulfill an even more expanded version of YOU? Are you feeling stuck yet wanting to move forward?Do you want to build deeper connection in your relationships? An Emotional Empowerment Signature Session with me will focus on bringing you clarity to an existing theme of your choice, that you would like to understand better. The possibilities with this work are endless and I will support you in facilitating some movement forward in the direction of your dreams while increasing your feel good fitness in every area of your life. learn more about what you may need to move forward! 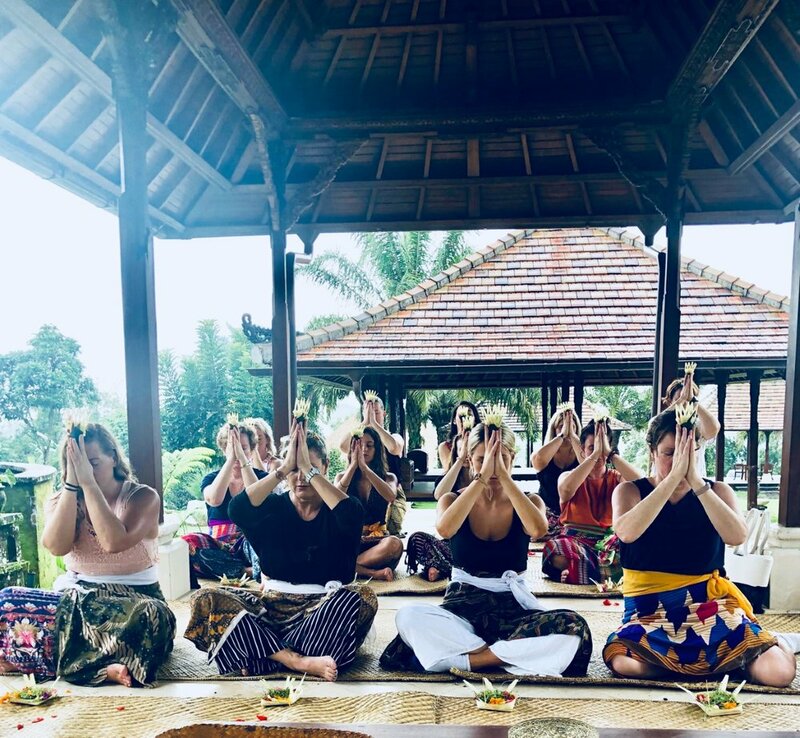 A SOULFUL+LIFE ENHANCING experience that brings women together for 5 nights of healthy eating, soulful wellness + meditation workshops, yoga classes, cycling through the rice paddy fields, a sound healing session, spa treatments, waterfall adventures, nature hikes, shopping and so much life enhancing fun with the girls!